With 3 stays already complete, Donegan will next take up a residency in the Somme region of Péronne in July and later nearer the inauguration, to see the gardens design, its construction and finishing details to its completion. With an eye on the future, this Garden of Peace will be testimony to the vitality of artistic creation in Ireland and to Franco-Irish friendship 100 years after the end of the First World War. Of note, this is not a memorial garden. It is a garden of peace, for those who visit there and the People of Peronne. The Historial of the Great War, was created in 1992 on the initiative of the county of the Somme. It is in two museums in the heart of the battlefields of the Somme, one in Peronne and the other in Thiepval. In these 2 museums the first world war can be seen in all its magnitude. 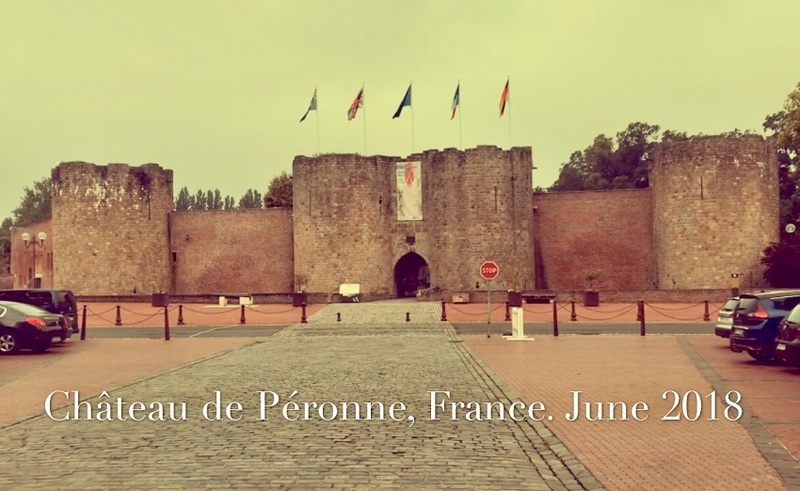 The contemporary museum of Péronne, is built within the medieval castle, badly damaged during the First World War, which dates back to the 13th century and is the emblem of the city. The battle of the Somme was fought by the British and French against the Germans, from 1st July to 18th November 1916. The objective for the allies was to relieve the pressure on the French defenders at Verdun by diverting German reserves to the battle of the Somme. It was one of the deadliest battles in history, with about 1,060,000 casualties, including about 442,000 dead or missing (420,000 of them were British). The first day of this battle, 1st July 1916, was catastrophic for the British army with 58,000 casualties including 19,240 dead. The British army will call 1st July 1916 the bloodiest day of its military history. This project is initiated by the Association Art & gardens – Hauts-de-France and by the First World War Centenary Partnership Program, in agreement with the French Ministry of Culture. The First World War Centenary Partnership Program is a public interest group established in 2012 by the Government for the preparation and implementation of the commemorative program for the First War centenary. Created by landscapers from countries which fought in the region, these artistic gardens will be grouped in clusters of three to four gardens, each located near Great War memorial sites and memorial tourism routes. These gardens will be created in 2018 to be presented to the public in summer and inaugurated in autumn 2018, one century after the fighting of the Great War. One of these clusters is to be located in Péronne, in Somme Department (France).